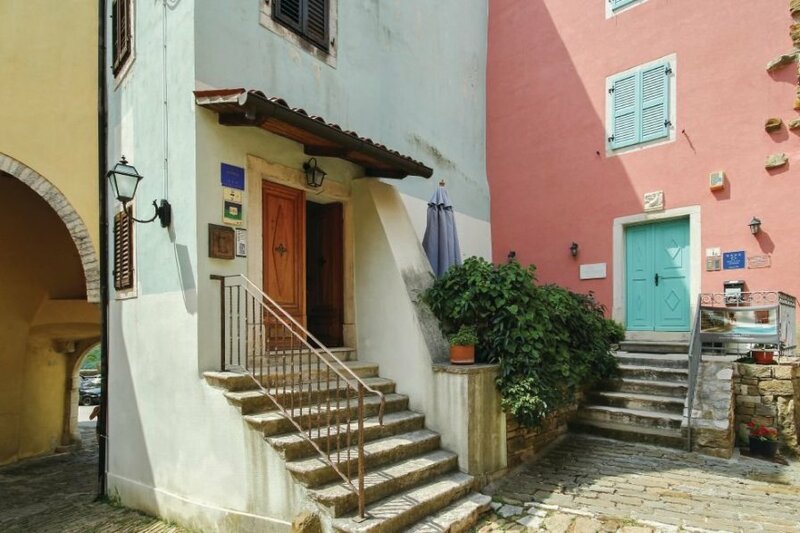 This semi-detached house is situated in the picturesque old town of Oprtalj, close to the local road. The rooms are comfortable and spread across three floors. This semi-detached house is situated in the picturesque old town of Oprtalj, close to the local road. The rooms are comfortable and spread across three floors. The rooms offer a lovely view of the ancient town. The covered terrace on the first floor is ideal for socialising and enjoying the evenings in the company of friends, in warm and cosy atmosphere. The town is known for its ancient monuments and Venetian style of architecture. A bedroom is situated in the loft with minimum ceiling height of 120 cm. This villa is made from brick or stone and was originally built in 1780 and refurbished in 2009. The agent has rated it as a three star property so it is a well-kept villa, equipped with standard furniture. It is also good value for money. This villa has restricted sea view and is located in Oprtalj, 25km from Novigrad. It is set in a good location: there is a restaurant 7km away. The villa has free wireless internet. You can also park on-site at no extra charge. The villa is adequately equipped: it has a refrigerator. It also has a barbecue.